Lasagna is a beautiful Italian pasta dish. Crunchy vegetarian lasagna is one of my most favorite meals. I never found a good vegetarian lasagna with lots of vegetables in any restaurant I went to. 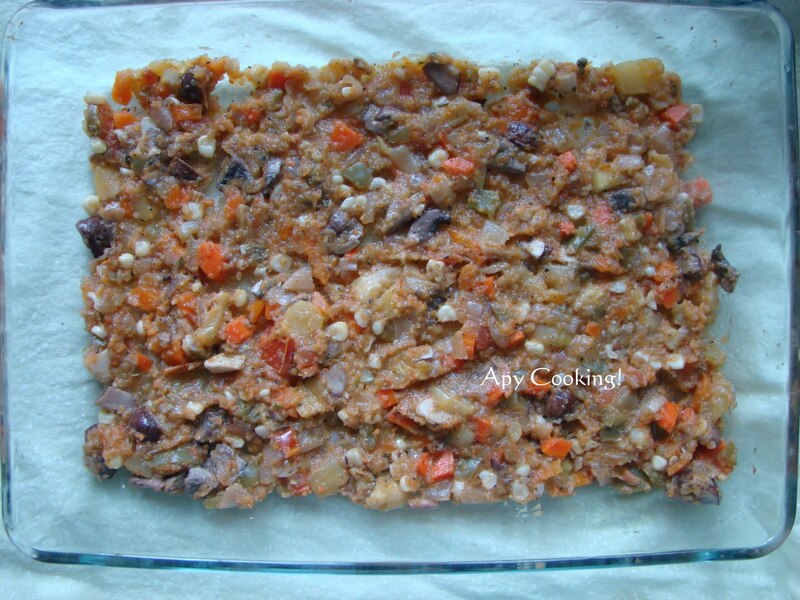 I do eat meat, but it was the different crunchy vegetables that I craved for in my lasagna. That's when I decided to make it at home. I had no clue how to make lasagna. I watched some videos on youtube, kind of understood the concept and decided to go ahead with it. Initially, I used the sauce I usually make for pasta. My friend Shraddha had given me a simple recipe for an easy sauce with just onion, garlic, tomatoes - roast and blend all of these and add Italian seasoning. To this I would add roasted vegetables - all my favourite ones. Recently I also blended some roasted vegetables and liked the outcome. So now I use this technique to make the sauce, which adds a lot of flavour to the sauce. This is definitely time consuming but very nutritious, so I always prefer it to store bought sauce. Usually when I make lasagna, I use only this sauce since I try to avoid white sauce (with maida) and ricotta cheese sauce (since it takes in loads of cheese). But when I make this for a potluck or for guests at home, I do make use of the ricotta sauce as well, to add another dimension to the layered treat. Before I get onto the recipe (and it's about time I did! 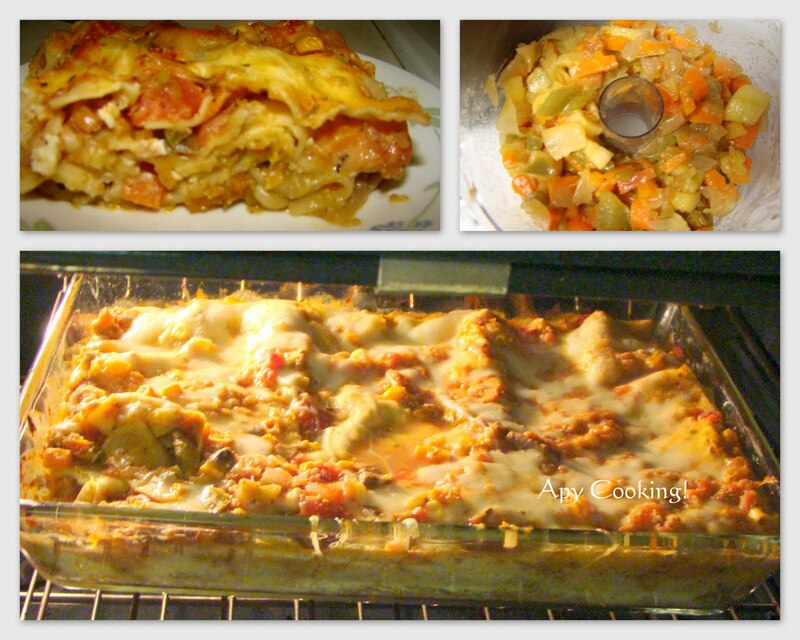 ), let me also tell you that I used 'No boil' lasagne for this dish. You could go ahead and use the regular lasagne and boil them as per package instructions. Also, there is no rule to what sauce you use for this dish, so you can toy with different ingredients to see what you like best, or just use store bought sauce if you want to save time. Heat oil. Saute garlic and onions till they are slighlty brownish. Saute tomatoes till they get cooked. Finely chop rest of the vegetables, add them to the pan and roast them till they are completely cooked. Allow to cool. 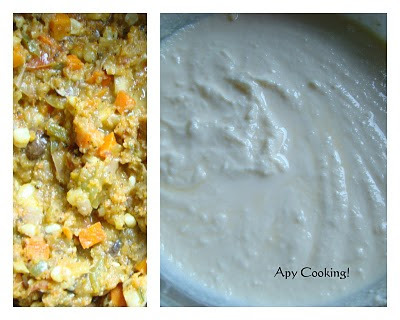 Take half of these vegetables and blend them into a smooth paste with a little water. 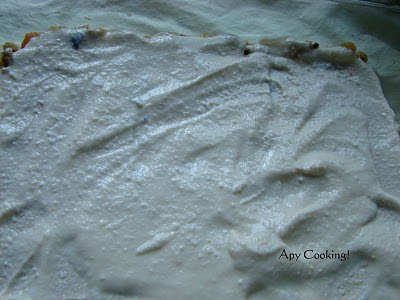 Transfer the paste back into the pan and mix well. Add corn and half a cup of water and cook for a few minutes. Add salt, herbs and the chilli flakes. You can use dried herbs as well. Add garlic powder for an extra kick of garlic. You could even sneak in some healthy ground flax seeds and no one will notice! This recipe is from the package of 'Barilla' Lasagne. This contains eggs and lots of ricotta (ah, the creamy paneer! ), mozarella and parmesan cheese. 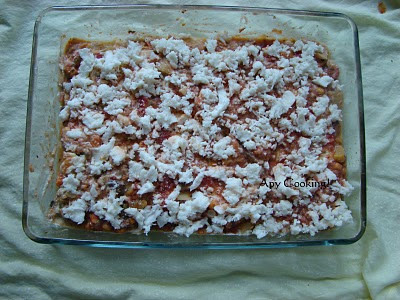 I omitted the mozarella and parmesan, since I would anyway be topping the lasagna with mozarella just before baking. If you don't prefer eggs, you can omit them in the sauce or even omit the sauce altogether and use only sauce1 in your lasagna. Just make sure you increase the quantity of sauce1 so that you don't run out of it. In a medium bowl, beat eggs. Stir in the ricotta cheese, mozarella and parmesan. You could even add frozen thawed spinach. Take a 9 X 13 inch oven safe pan. Spread a little of sauce 1. Apply a thin layer of sauce 2. You can sprinkle some parmesan and mozarella here. 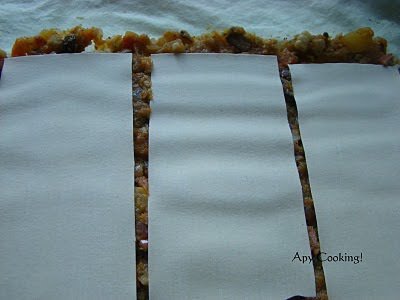 Keep layering till you use up all the sheets and all the sauce making sure the sauce layer comes on top. Spread mozarella cheese all over the top. Cover tightly with an aluminium foil and bake in a preheated oven at 375ºF for 50 to 60 mts (for the 'no boil' lasagna). When you peek into the oven you should see the sauces bubbling up. 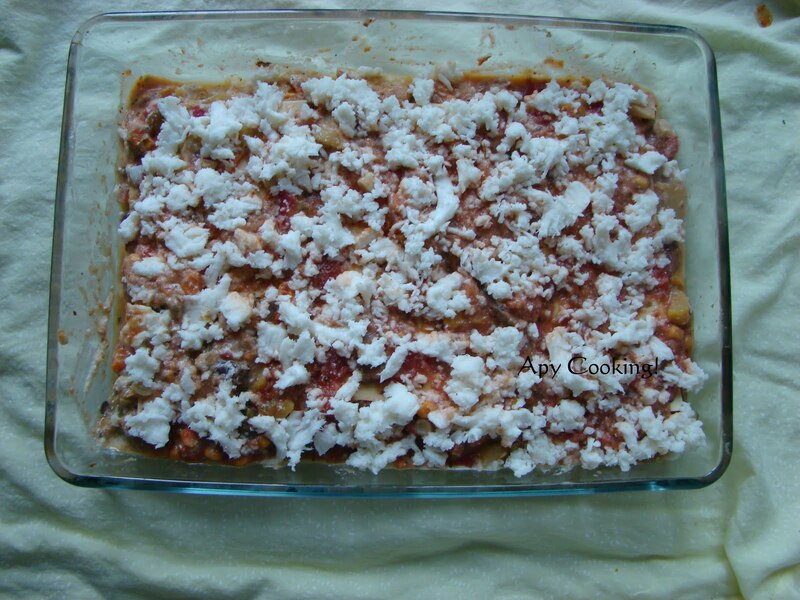 Uncover and bake for another 5 to 10 minutes until the cheese on top melts and the lasagna looks golden brown. 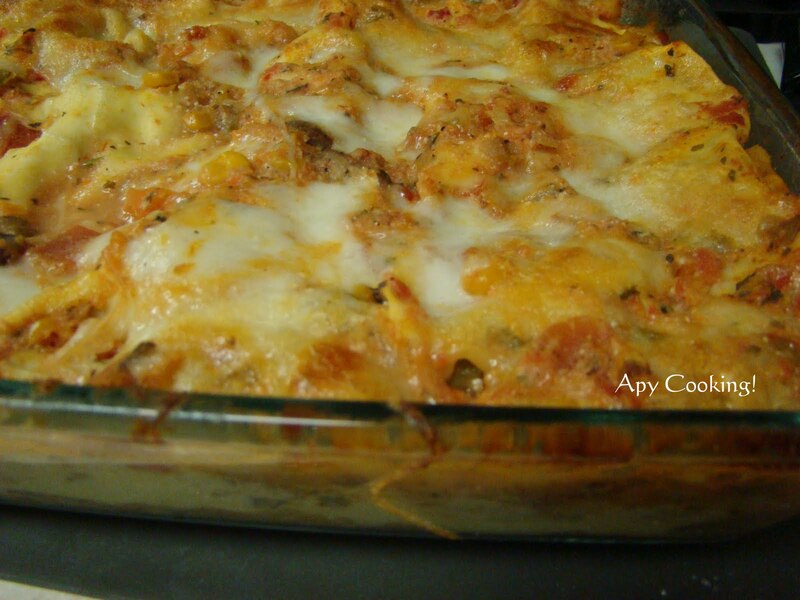 Allow 15 minutes for the lasagna to soak in all the sauces before you feast on this bubbling goodness! 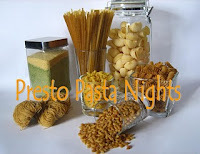 The luscious layers will join the Presto Pasta Night hosted this week by Nic, originally started by Ruth. Also sending this to the weekly Bake Off event by Champa. Though this one looks like a time consuming dish but the end result is superb !!! Slurpp, such a tempting lasagna...makes me hungry..
Apy, I love the lasagna and love it with loads of veggies too, will love to give this a shot but without the eggs. Mmmmm! So lovely and yummy! I love lasagna..this looks super delicious!! I like Lasagna of all sorts and looking at what made your bake, it sure is delciious. This looks delicious, especially with the addition of ricotta. Thank you for adding it to this weeks Presto Pasta Nights. Aparna, Thanks for the email. Lasagna looks great. Everything seems to be working fine with my blog. Could you add the link and let me know? I love tons of veggies in my lasagna as well! Mixing them into the sauce must make it extra tasty. Great dish! I must agree that lasagne never fails to deliver delicious results.